Flying Apsaras Awards represents the government branch of Chinese drama awards, and are usually held on odd-numbered years to avoid clashing with the Golden Eagle Awards. Because the awards shows are government endorsed, the Flying Asparas are taken very seriously, and that means all nominees turn up, which makes the live stream that much more interesting. Red carpet round up and winners list below. Sun Li took home the Best Actress award, making her the first post-80s actress to net a television awards grand slam. I consider the Legend of Zhen Huan to be Sun Li’s peak in terms of acting, and was bummed she didn’t receive any official acting nods back then. Sun Li’s great in Nothing Gold Can Stay as well, and a deserving recipient of the award -I’d say she’s a shoe-in for the upcoming Golden Eagle and Magnolia Awards if not for Qin Hailu’s excellent performance in White Deer Plain. I’m surprised Chen Baoguo, Zhang Jiayi (who played the lead in 7 dramas over the past year) and Wu Xiubo didn’t receive any acting nominations, though congratulations are in for dark horse winner Zhang Tong (he played the second sister’s love interest in The Seven Fairies 欢天喜地七仙女), who is also the first post-80s actor to win such an award. Liu Tao in Sachin & Babi: Her latest red carpet outfits have been fantastic, and this one is no exception. 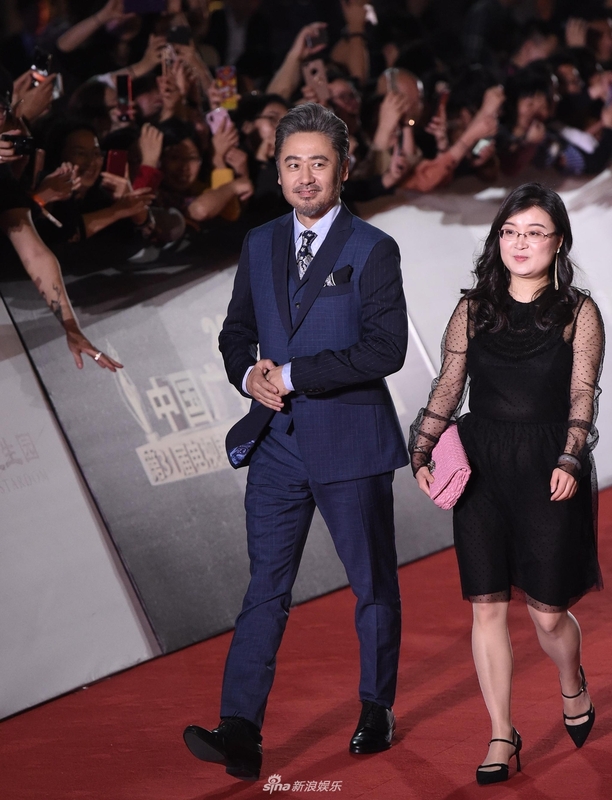 Qin Hailu (Dolce & Gabbana) and Zhang Jiayi: Hailu’s number only looks good from certain angles, but she gets extra points for bringing one of the few splashes of colour to the red carpet. Yin Tao (Marc Jacobs, Chicco Mao) and Zhang Yi: They clearly called each other up before hand to match outfits, and it works. This entry was posted in Events, Mainland China and tagged awards, Flying Apsaras Awards, Jiang Xin, Liu Tao, Qin Hailu, Sun Li, Wu Xiubo, Yin Tao, Zhang Jiayi, Zhang Yi by XDramasX. Bookmark the permalink. Thank you. How interesting. I hadn’t realized Chang Jiang is a female scriptwriter. Did you watch the entire White Deer Plain drama? I know it looks like a good production, but I cannot take that many episodes of tough life. Did you watch dramas listed above beyond Advisors and Nothing Gold? If yes, did you find them enjoyable? Rarely see blog posts on Qin Hailu on other websites. She’s a versatile actress with screen presence. Sun Li didn’t attend the ceremony with her husband? White Deer Plain dragged from the very beginning, and apparently has a lot of family in-fighting, so I dropped it very early on. A Love For Separation 小别离 talks about sending children overseas, but the main couple’s daughter rubbed me the wrong way (Zhang Zifeng is a great teen actress though). Ode to Joy gets progressively worse with each passing season – I can’t believe they’re actually planning for a third. I rarely see couples attend awards ceremonies together unless they both have nominated works. Deng Chao hasn’t been in a drama for years, and after winning Best Actor at the Golden Roosters, I think he’d rather focus on his film career. It does look like many of the titles above have high risk of in-fighting sub-plots. C drama favor kids with a lot of character? Guan Xiaotong did so many of them. The teen son character in Old Boy also does his fair share of complaints. He complains about the lack of various fancy items to selected adults around him. Even his mom’s recent death didn’t seem to slow his complaints too much. I don’t find these characters endearing. Some female leads have this syndrome. Maggie Jiang seems to have done a few of those? Wang Xiaochen looks to be another one. Wang Luodan, Qi Wei may have done a few too. Zheng Kai does the male version. I just don’t understand the point to these characters. I’m not sure what others enjoy in watching these characters. I assume there must be, or they wouldn’t keep churning out these characters. Some high-pitched voiced actresses can really turn the whole long-bickering ordeal into a nightmare. And they make such long dramas these days, it’s hard to even sit through the first 10 eps with these characters. I didn’t feel like watching the whole Red Sorghum drama but I did watch and liked some of the acting performances. Zhou Xun, Zhu Yawen, Qin Hailu. Wu Zetian makes for a much better drama material than Dowager Cixi. But I find it difficult to find the right balance in a Wu Zetian drama. It’s either too idol-esque ala Fan Bingbing, or it’s bogged down by other problems. Some of the long-suffering C dramas don’t seem to have a satisfying resolution? I don’t like watching 70 eps of people living a miserable life with no life improvement in sight.